MACKAY, Dr. J. Ross O.C., F.R.S.C. In the early hours of Tues. Oct. 28 2014, Ross Mackay (“JRM”), age 98, embarked on one last field trip. He spent the last four years in the Okanagan (Kelowna), living at Orchard Manor, enjoying family dinners, strolls along Fascieux Creek, working on his computer, and thinking up plans for new research projects. Happily, he was able to make 2 more trips to the Arctic (2010 and 2011) accompanying his former student and colleague, Chris Burn into the field. Ross was born in Tamsui, Formosa (now Taiwan), the son of Canadian missionary parents. He attended school at the Canadian Academy in Kobe, Japan, a 3 day journey from home. Even at a young age, Ross had an enquiring mind and loved animals and the natural world. One of his favourite memories was of hiking with his family up Mount Morrison in Formosa. He was an outstanding athlete and scholar. 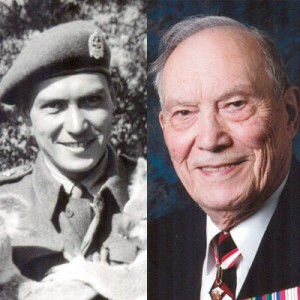 Ross completed his BA at Clark University and his MA at Boston University, but he interrupted his graduate studies in 1941 to join the war effort as a private in the Royal Canadian Artillery. During the war, he was transferred to the Intelligence Corps. In 1945, he commanded the Canadian Intelligence Unit in Darwin, Australia and was proud to know his efforts saved the lives of many people. He ended his military service with the rank of Major. After the war, he completed his PhD at the University of Montreal and then moved to Vancouver. For most of his career, Ross taught Geography at UBC and conducted over 60 years of field research on permafrost in the Northwest Territories. The field work in the Mackenzie Delta, Garry Island, Paulatuk and other sites in the Western Arctic, left him with an enduring love of the North and its people. He was proud to be called a Paulatuk “elder”. His exemplary field methods resulted in several fundamental discoveries. In particular, his research into the origin of pingos and the development of tundra polygons brought him much recognition in Canada and around the world. He wore his Order of Canada insignia with pride and received numerous honours and distinctions from his fellow scientists in Russia, China, Europe, the US and Canada. He published over two hundred scholarly works. Ross leaves behind his sister Margaret Mackay (Toronto), his daughter Anne Mackay (John Bellamy) of Kelowna, his adoptive family the Kennedys in Coldstream (Cristi, David, Courtney, Jayden) , his daughter Leslie Jenkins (Dave) of Osoyoos, 2 grandchildren (Marc, Michelle) and 2 great grandchildren (Jared and Emily). Ross was pre-deceased by his brother Leslie (killed in WW 2), his beloved wife of 53 years, Violet (his “southern comfort”), and his 2 sisters Anna and Isabel Mackay of Toronto. Many thanks to friends and family and the staff of Orchard Manor who all enriched Ross’s long and satisfying life. We will miss his positive outlook, “just right” philosophy and his encouragement to “relapse” (relax). In memory of Ross, please gather with friends and family, share a glass, and reminisce about times past. What a wonderfully accomplished life your Dad had, Anne. I am sorry to read the news of his passing but hope you find comfort in the memories of the time you had with him. I was very fortunate to be in one of Dr. Mackay’s classes at UBC in the 1950’s. Decades later, when I saw my first pingo, I immediately and happily thought of him. Many thanks to Dr. Mackay’s family for sharing his history and great accomplishments by writing such a caring obituary. Ross Mackay was one of the triumvirate of senior scholars at the UBC geography department when I did graduate work there in the 1960s. I remember him as a meticulous scholar, a model for all aspiring researchers, but also as a kind and thoughtful teacher. I am so glad to know that he was able to continue an active interest in the Arctic well into his 90s and that he spent his final years with a loving family. I am sorry to read of the passing of your father Dr Ross Mackay,the grandson of the Rev’d Dr.George Leslie Mackay, the beloved missionary doctor honoured by Taiwanese & Canadians for establishing churches, schools & the Mackay Clinic in Tamsui, Taiwan. After visiting Tamsui & seeing the Mackay Memorial Hospital in Taipei, it was a thrill for me to learn that his grandson Ross Mackay was living in Vancouver. Leslie, the wonderful obituary paying respect to your 98 yr old father shows that he was a remarkable man who is gone now & this world is lessened because he is no longer a part of it. I am sure he will never be forgotten by those whose lives he touched. May your own cherished memories of a father, grandfather & great grandfather bring all of you comfort at this time. Ross and my father, Chuck Williams, were childhood friends where they met as young students in Formosa. I have some fond memories of visiting Ross and Violet in Vancouver. In particular they had a pet skunk which was quite a shock when it greeted us at the door with its tail up! Fortunately it was de-scented. While we had lost touch over the past number of years, we still have good memories of stories Chuck used to tell of his exploits with Ross. Our condolences to his family, particularly to Leslie who married my classmate, Dave. What an amazing man! I was a teenager when I met Ross, but my father knew him as a boy in Formosa, where they were friends. Many years later Dad saw Ross waiting for a bus in the pouring rain. It wasn’t until Dad picked him up that he realized who he was! We had many lovely visits with Ross and family. My condolences to Anne, Leslie and families. My condolences to Ross’ immediate family. Ross always inspired intellectual curiosity and welcomed me to his home and family. He was a person to make a difference in the lives of many and for that we must be thankful. Unexpectedly, I was very surprised to receive your father’s photo with his letter of 9 April 1999 which I never saw it before. I appreciated his very kind thoughtfulness. Your father knew my father(Douglas Sam). They both worked for the military intelligence in Ottawa in March 1945. I am glad to know that your father received his Order of Canada. He deserved that. Please accept my deepest condolences to your family. Condolences from the three remaining first cousins of Ross Mackay on the Ross side: Vida Ruth (and Ken) Hickey in North Carolina, Grace (and Don) McGowan in Victoria BC, and Betsy (Bessie Jean) Bosma in Mackenzie, BC, and their families. My condolences on your loss. Although I only met him once when I was very young I remember mom (Ann) his first cousin telling me interesting stories about his life and he always seemed to have lived such a full life. I met Professor Mackay in June 2004, at the dedication of the statue of his Paternal Grandfather in Woodstock ON. As a Geography major from York U., I learned about pingos, not realizing who the “expert” was. I am also thrilled to have the plaque presented to Professor Mackay from the Taiwanese Postal Service with the stamp in honour of this Grandfather, sitting in front of me, in The National Presbyterian Museum in Toronto, of which I’m the Volunteer Site Liaison; of course, the story of both his grandparents, both Maternal and Paternal, is offered on Museum Tours, and I guess this obituary notice will be put on file, to partially interpret this artifact. Thank you for sharing his lengthy life in this message. Our condolences on the loss of your father, who was a distant relation of mine (his grandfather George Leslie Mackay was my great great great great great uncle, give or take a few greats). George Leslie baptized my grandmother in Ontario. I shall think of him with fondness.